Nationwide — Millions of children being raised by a single parent have inevitably wondered, “Why did my mother or father abandon me?” A new children’s book, I Didn’t Leave Because of You, seeks to answer that question with a compassionate and healing response. Author, Tyechia White, was inspired to change the popular narrative that absent parents are merely deadbeats while reconciling with her father after nearly 30 years. It was during her care for her father during his short battle with a terminal cancer that the author learned more about her father’s struggles and came to view her father’s absence as an act of love. I Didn’t Leave Because of You is written as a gentle poem in the voice of the absent parent offering alternative reasons for his or her absence. Each of the reasons in the book are personal for the author and resonate with other stories shared about absent parents. This book has beautiful and diverse illustrations to help capture the emotion of sadness rather than anger in order to help children heal. Whether you are seeking to help a child cope with an absent parent or searching for your own healing, this book is sure to help with the journey toward understanding and forgiveness. 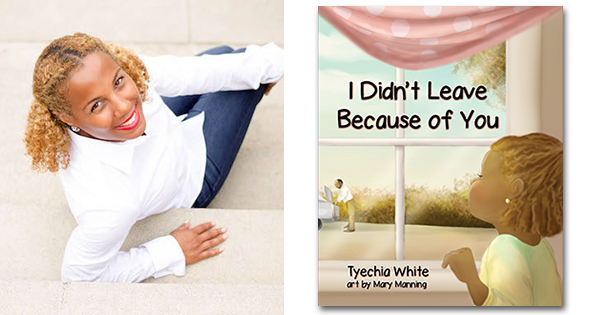 Born and raised in Rocky Mount, North Carolina, author Tyechia White is now an attorney practicing in Washington, D.C. Tyechia seeks to develop a style of children’s books that combine emotion with beauty for the purpose of helping both child and parent heal and build stronger bonds. I Didn’t Leave Because of You can be purchased online at Amazon, Barnes & Noble, Mascot Books, and Target or by visiting the author’s website at www.tyechiawhite.com. For more information on book-signings, storytelling events, bulk purchases, speaking engagements or interviews, please contact the author at author@tyechiawhite.com. 24-Year Old Black Student Graduates With Two Degrees From Two Different Colleges… on the Same Day!